SamSung today launched the first solar mobile phone to Indian market . 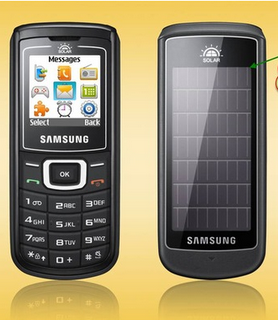 The phone falls under Samsung’s Guru series of music phones and its named as solar Guru E1107 . solar Guru E1107 has both solar and electric charging facilities . According to SamSung ,solar Guru will be able to provide 5-10 minutes of talk time with 1 hour of recharge . SamSung solar Guru E1107 will be an entry level mobile phone , but it will have mp3 player ,FM reorder, ,expandable memory etc . Solar charging can be depended in needy situations , and that makes Guru E1107 the best phone for people looking for an entry level mobile suitable to be used in village and remote areas where there is frequented instabilities in power supply. Guru solar will be priced at 2799 excluding VAT and other local taxes . Couple of pieces were imported form south Korea and will be introduced to SamSung dealers all over India to the end of June . SamSung will launch the variants of this model all over world by July .